So, how does one start making a tandoori dish without a tandoor? Leave that for the oven to figure out. All you need to care about is–buy the best (read freshest) fish available, gut it, clean it, slash it and marinate it in this five-minute marinade. The coolest thing about it, is the longer it is marinated the more robust and enhanced are the flavours. Which makes it perfect entree for a party. 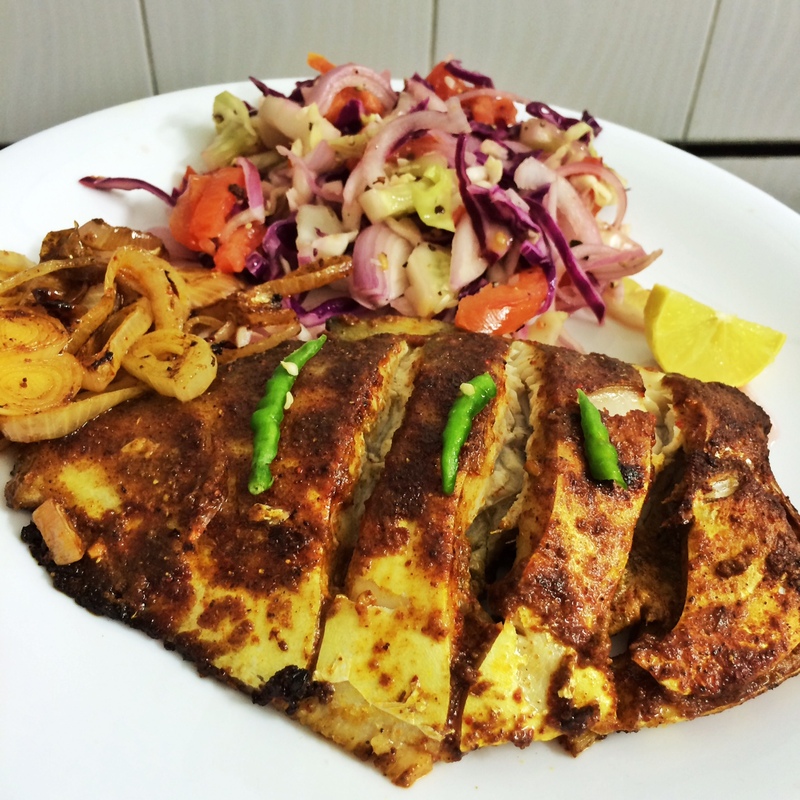 The crispy skin, golden glow tandoori fish is quite a “pick-me-up” on any dinner table. What’s more you can garnish the plate with some onions that have been left soaking in vinegar, sugar and salt till they have achieved a pinkish tone; and freshly chopped tomato and cucumber to create an absolute down to earth, homely and eye-catching platter. Traditionally tandoori food originated in Persia and came to India via Afghanistan and the tandoor was nothing more than a conventional clay oven with temperatures ranging at anything around 500 degree Celsius, which was used to bake breads called Naan. It was King Jehangir was introduced the first Tandoori chooza and chicken to the platter. Once the first protein was introduced the others didn’t take long to follow. Today crabs, prawns, fish, chicken and even various vegetables and milk products like paneer are cooked inside a tandoor, in spices that have traditionally come together to create the tandoori masala. This recipe takes on all the flavours from the traditional procedure, but has been grilled (not baked) in a normal oven at home making it a recipe all of us can cook at home. I’ve used a full pomfret here, but you can use King prawns, crabs, Indian Surmai (kingfish) or any other fish for the preparation. I’ve never tried river fish, but that because I don’t like the texture, but feel free to experiment! If the fish weighs more than a kilogram, I suggest use slices, to ensure the cooking process doesn’t dry the juices out and cut the cooking time to 5-7 mins per side. 1. Marinate the fish in the marinade for anything more than 2 hours. 2. Cover your grilling plate with foil. 3. Place a few roundels of onion towards the centre of your foil and place your fish on it. This aids the cooking process, flipping the fish and gives you a crisper skin. Plus the onions impart a lovely aroma, but more about that later. 4. Grill the fish in a pre heated oven 200 degree C for about 15 minutes, the top of the fish will be crispy by then. Flip the fish around, making sure the onions stay in place and grill the second side for 10 minutes. 5. When both the sides are crispy, set the fish aside. Remove the onions and stir them in a pan till they are golden. 6. Serve the fish with the sautéed onions and a salad. Please by all means feel free to share my blog. No am sorry have no tips on Yahoo News. But thanks for liking the blog!